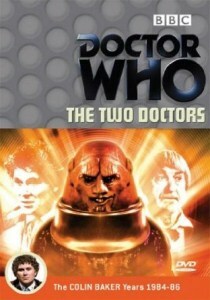 ‘The Two Doctors’ has a mixed reputation and is unabashedly a far departure from the somewhat lighter and more celebratory nature of the previous multi-Doctor tales ‘The Three Doctors’ and ‘The Five Doctors.’ Indeed, writer Robert Holmes’s trademark cynicism fits in perfectly with the more sinister trajectory Doctor Who began taking under producer John Nathan-Turner, though he also manages to impart a more likable edge to the gruff Sixth Doctor as the character’s insults are tempered by a genuine sense of wit and intelligence, firmly establishing him as the genuine Doctor by the end of events while paired with his second incarnation. Anyone with knowledge of the Second Doctor would be forgiven for thinking that ‘The Two Doctors’ would emphasize the character’s more comedic and impish nature that has only become more fondly remembered in the years since his regeneration. And although Patrick Troughton does prove adept at stealing the scene whenever he can instill a bit of comedy into proceedings, the serial as a whole is incredibly dark. Unfortunately, while the Sixth Doctor is purposefully a bit rough around the edges, even if the more violent means by which the writers chose to convey this remain questionable, it’s strangely the Second Doctor who is written as having some of the more questionable traits, specifically regarding an apparent disregard for the individual beings of the universe. He is rightfully furious when he finds out about Dastari’s experiments to enhance the Androgum race, but it’s only because of the potential for evil those enhancements will allow rather than because of the actual experiments on a sentient race. Along with a distinctly colonial attitude and a moment where he even tells his beloved companion Jamie to hold his mongrel tongue, this is certainly not the most flattering interpretation of the iconic Second Doctor. Nonetheless, Robert Holmes does have first-hand experience writing for the Second Doctor from that original era, and by bringing these attributes to the forefront seems to be suggesting that many of the more controversial aspects of the Sixth Doctor have been plainly apparent to some extent throughout all of the franchise’s different eras. Indeed, displaying the treatment of the Androgums within the context of the politics of race is one of the strongest components of ‘The Two Doctors,’ ensuring that it always remains topical for those able to look beyond the superficial as Chessene tries to pass by within human society. Yet it’s Chessene’s resultant distancing of herself from her Androgum roots during her continued attempts to fit in with human society that speaks volumes about human culture as a whole and individuals’ attempts to fit in no matter the cost. Although it seems somewhat of a missed opportunity not to have the Second Doctor repent after being turned into one of the very monsters he is seemingly so adamantly against, the Sixth Doctor does at least seem to take notice of the fact, and surely Dastari and Chessene’s human-like appearances makes the entire serial that bit more powerful since the true foes of the piece are not clad in elaborate costumes or prosthetics. Holmes also proves time and time again that he is certainly aware of the continuity conundrum that having an older Second Doctor and Jamie meeting the Sixth Doctor poses, suggesting that the Second Doctor at one point became a sort of Time Lord agent who did their bidding. This perhaps fits with events from the later Third and Fourth Doctor eras, but it does ask for an incredible amount to be fit in off-screen before or during the Second Doctor’s regeneration process. Of course, the fact that the Second Doctor comes so perilously close to death poses the ultimate what-if scenario given all of the successive incarnations that had been televised to this point, and the Sixth Doctor certainly makes no qualms about suggesting just how serious the ramifications of that death would be. Even with the Sontarans attempting to create their own time machines as another plot point, it’s clear that ‘The Two Doctors’ is very much built upon nostalgia, just not the sort of happy nostalgia that had so pervaded earlier multi-Doctor tales. Instead, this story is just as dark and graphic as those around it, and the use of the Second Doctor to compare and contrast such a fondly-remembered era with one that had been introduced to a rather tepid response is brilliantly effective even if sometimes a bit unnerving. Nonetheless, the Second Doctor and Jamie alongside the Sixth Doctor and Peri make for an ever-enjoyable grouping that creates wonderful interactions amidst a wonderful setting even if the overall pacing is somewhat disjointed.